People of all ages love to hear they are getting a cookie for breakfast or for a mid afternoon snack, right? 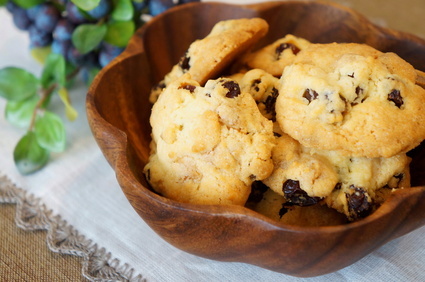 I love this recipe for my raisin and apricot breakfast cookies because they are filling with oats and fruit and they offer a healthy, yet fun, twist on a recipe that can fill in any snack gap of the day. In a large bowl, combine the brown sugar, oats, flour, baking soda, baking powder, salt and cinnamon. Add the oil, prune puree, orange juice, egg whites and vanilla. Mix until blended. Add the raisins and apricots. Grease cookie sheets and scoop 2 generous tablespoons of dough per cookie. Bake 10-11 minutes, until just set; do not overbake. Cool cookies on a rack. Store in airtight container. Hi, question regarding the brown sugar. The instructions don’t mention it. I assume I add it with the dry ingredients, correct? Yes, the brown sugar should be the first ingredient into the bowl! Enjoy!